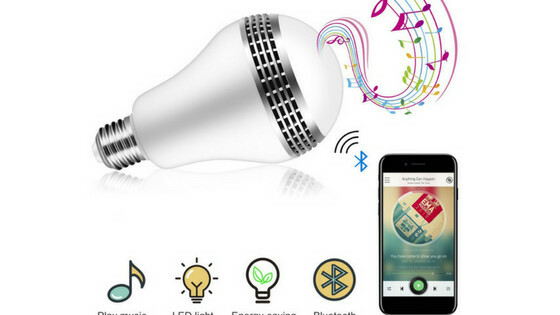 Have you ever heard about a Bluetooth light bulb speakers? 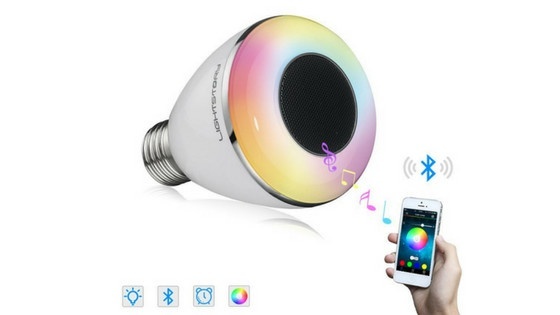 Have you ever heard about a Bluetooth light bulb speakers? This tiny product is exactly what it sounds like. It packs the power of music into LED light bulbs. This cool concept can take sound into spaces you never thought of before. For example, a bathroom (if you don’t want to invest in shower speakers), bedroom, or to an outdoor party. Just like watches, cameras and door locks, light bulbs have become more complex over the last few years. Replacing standard light bulb with its smarter sibling can save you energy, and converts your home into a place that can be controlled remotely by smartphone or computer. Functionality and quality. If that is all you need, the Ustellar LED wireless light bulb speaker is an interesting choice for you. 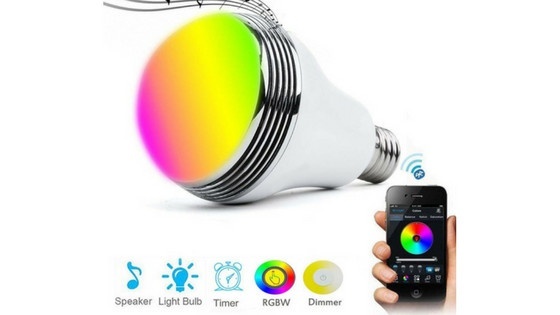 This product can act like a normal light bulb, but pair it with your phone and you get access to 13 color choices, 3 modes, and a decent sounding speaker. 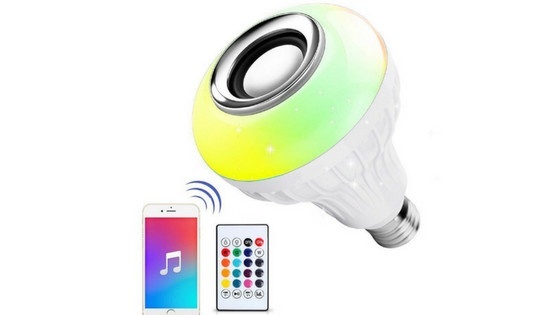 The Unstellar light bulb speaker pairs easily with any recent Bluetooth devices or you can use include a remote control to set colors and strength of the lighting. NOTE: Install this Bluetooth light bulb in the bathroom. It will improve the shower time by playing favorite music of yours. The bulb remembers its settings from one day to the next, and with the flicker mode, the colorful light twinkle according to music rhythm. ICOCO smart speaker light doesn´t offer the best performing speaker, but if your goal is just to have an average working speaker bulb for the lowest price as possible, ICOCO will serve the purpose. It gives you enough colors (16), wireless connection, and simple set up without a need for an app to enjoy it. NOTE: Don´t put the speaker light bulb somewhere you won’t have a strong light because ICOCO doesn´t offer the brightest light. Simple, efficient and customizable. These three words describe MagicLight light bulbs best. They give you the ability to personalize your lighting with a color pallet of over 16 million colors and a variety of tones of white. Yes, the different colors and the ability to choose a variety of brightness options is the major asset of these smart LED bulb from MagicLight. Super easy to set up, and the app running the light is good. Honestly, the official Bluetooth app is not the greatest, but it gives you an interesting option to automatically change lights to match your music, or control each bulb individually, or together as a group. Overall, MagicLight smart light bulb is a good choice for mood seekers and with a lifetime of 20,000 hours even a good investment. NOTE: MagicLight requires Bluetooth 4.0 compatible devices to work properly. Works with Apple Watch, iPod, iPhone (4s and higher), iPad (3 and higher including iPad Air and Mini) and Android devices running Android 4.3 or above. 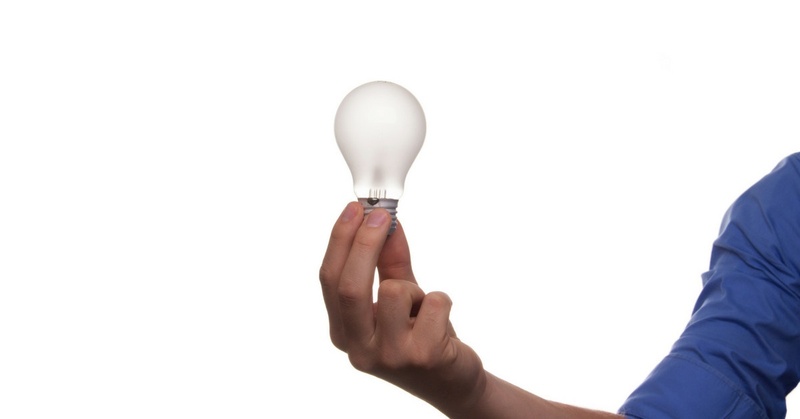 Many people think that a light bulb with the speaker is bright enough to replace a standalone light source. Not really. These bulbs are designed especially for creating various color modes of lightning, and in some cases, they can give a bright light for smaller spaces. It is always recommended to have them as a secondary light source. QiLi smart bulb with Bluetooth speaker is no exception. 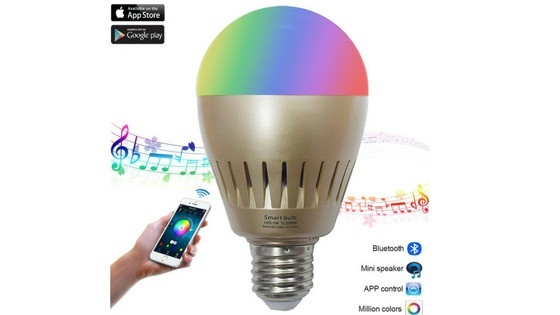 It is a decent app controlled bulb which can change color with music, has a timer mode to turn it on/off at any time, and 2 years warranty. IMPORTANT: Unlike MagicLight, this light bulb with a speaker can only be paired with a single device. This means that multiple bulb lights require multiple Bluetooth devices – one device = one bulb. 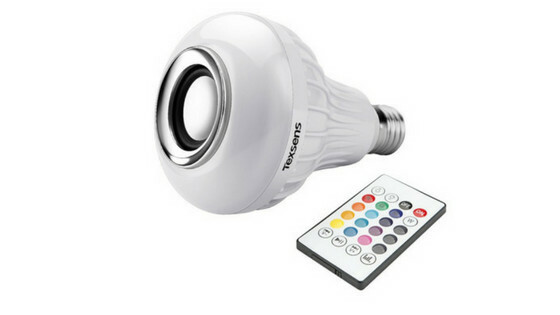 Texsens is another quality bulb speaker which offers a good way to personalize your lighting by using over 13 color changing and 4 modes with remote control. 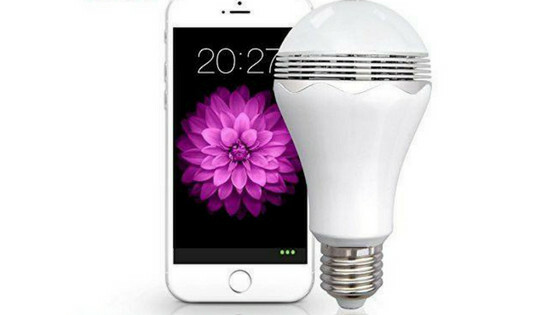 The bulb can be also controlled through an app, compatible with both Android and iOs devices. The app gives you access not only to the clear interface where you can control the lighting, color, modes but you are also able to set the timer to automatically turn off the bulb one you go to sleep or set it to wake you up with soft light and silent music. NOTE: Texsens light bulb is energy efficient, shock and vibrations resistant and really easy to set it up. It is comparable to a 50-watt halogen bulb with an advertising lifetime of 50,000 hours. 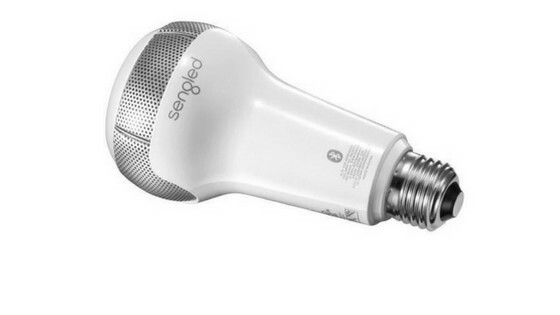 As described, Sengled Solo comes with built-in JBL speakers to deliver you left-right stereo effect. Just pair the bulb with your smartphone and play music from any mobile app (Spotify, Pandora, Apple Music). The app control is great, syncs instantly, but the sound quality is just good. Not the best sound performance you ever heard, but you can’t expect much from a speaker bulb. Unlike the other products above, Sengled Solo cannot change the color of light, it only dims it. 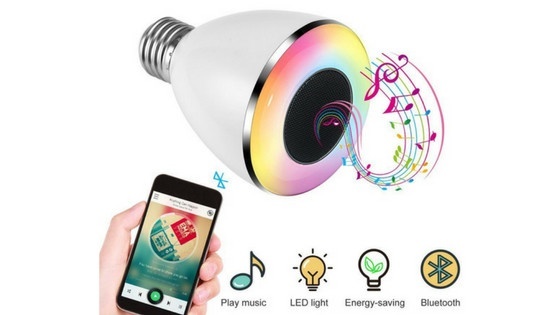 NOTE: Simply put, this light bulb gives you the ability to light up the room with energy efficient LED light, while enjoying your favorite music. The LightStory smart light bulb supports more than 12 different bright shades and 6500k multicolor changing. Unfortunately, the light is not bright enough to be used as a stand-alone lighting source. Probably the best idea is to use it for mood lighting only. The reason why LightStory is the best product on our list is the sound quality. Yes, the sound is surprisingly good for such a little speaker and it’s actually pretty loud at full volume. Just sync it with your phone and play any music you want off your phone, including streaming music or Youtube. NOTE: To control the bulb you need to download the official app called Light Story. After a quick setup, it allows you to control colors, light modes and music volume. Over 16 million colors and more than 12 different bright shades are ready to be used with the LESHP light bulb speaker. Just download the app, choose from one of the many modes or colors, and relax. You can even switch the light scenes, change the volume of music and set up an alarm. The Bluetooth 4.0 connection is stable and the sound performance of the speaker is well enough to provide clear and loud music. Not the best, but you get what you pay for. MORE: The musical light bulb can help to sleep better. Set up the time and the sound of music will gradually go off as well as the light will be powered off at the end of the countdown. Should I buy Santoro or another bulb on this list? In fact, there is no big difference between these products at all, each one has similar functions, features, only the sound quality varies. Santaro smart LED music bulb has an above average sounding speaker that is loud enough to fill even a larger room with music. Fully compatible with iOS and Android devices through Bluetooth, the app allows you to select from over 16 million colors and many tons. Each color is dimmable (0-100%), and is easily adjustable with settings like flashing with rhythm, rainbow kaleidoscope, setting a pulse, and a flickering candle. NOTE: The light quality is just fine, but the audio is very mid and high focused. The sound quality is good for spoken word, but worse when it comes to music. SOUND QUALITY – Don´t expect an awesome full sound of the expensive speaker. On the other hand, you don´t want to have a cheap sound of a birthday card. Pick carefully and read customer reviews. This can help you avoid crappy products. CONNECTIVITY – Most light bulb speakers are using a Bluetooth connection to a smartphone or tablet, but you can find units that can be used together with devices like Alexa or Google Assistant. PRICE – Overall cost depends on the product, but typically the price for LED Bluetooth light bulb is in a range from $15 – $50 dollars for a piece. POWER – Having an energy efficient LED light is always a good idea. Energy savings are important, but they shouldn’t be the main reason to buy this product. 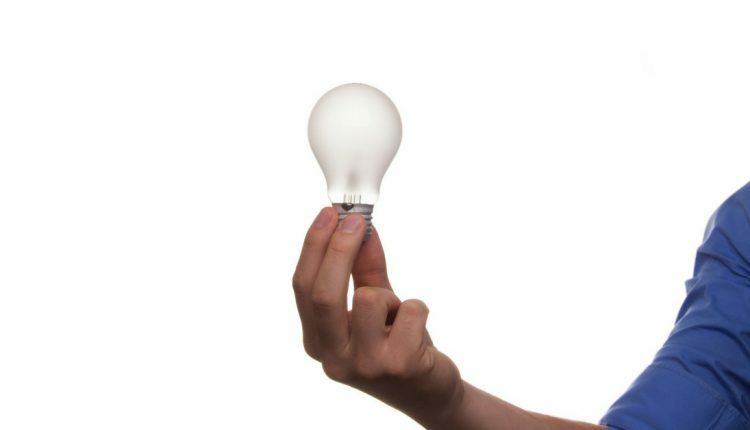 Power use often reflects the quality of speakers, so choosing a 1-watt speaker to safe energy will typically lead to an awful sounding bulb. The quality speakers should have at least 3-watt output. COLOR RANGE – High-performance RGB LED light source can make the visual effect more prominent and light softer as you like to protect your eyes. There are lighting modes, a variety of colors you can choose from. It isn’t difficult to find lighting bulb that suits you perfectly and meets your needs. A smart light bulb can be controlled remotely with your tablet or phone. 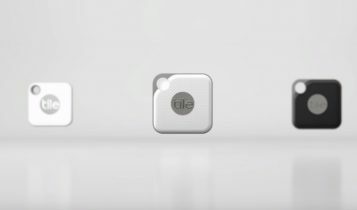 It comes with the ability to connect through Bluetooth or Wi-Fi, and turn your bulb on/off, set timers, adjust moods, play music, and much more. Cost savings. Smart light bulbs are energy efficient and they will also last much longer than traditional light bulbs. They are also packed with many features like remote control, light modes, various colors, and in some cases, they are able to replace a speaker. The installation is really simple. 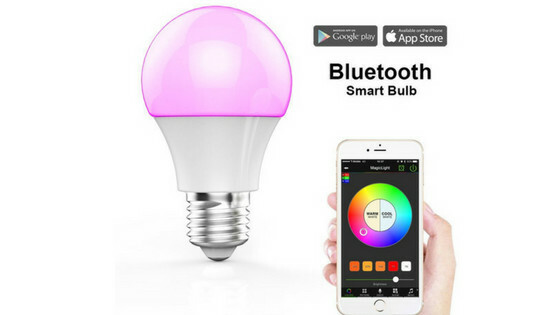 Just replace your old bulb with a smart, download the app to your phone/tablet, connect with Bluetooth or Wi-Fi, and it is ready. Bluetooth Speaker Light Bulb – Does it actually work? Where To Buy Philips Hue Lights? Disclosure: This post is brought to you by Nechstar team. We aim to highlight products and services you might find interesting, and if you buy them, we get a small share of the revenue from the sale from our commerce partners, including Amazon. 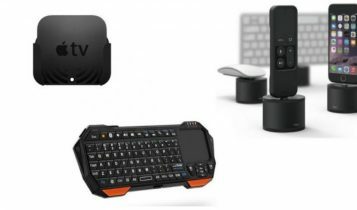 Clicking the device names, images or check price buttons will redirect you to the product listing on the appropriate Amazon.com (.co.uk, .de, etc. ), where you can find the updated prices, customer reviews, and more product details. Philips Dimmer Switch vs. Philips Hue Tap: Which Should You Buy? Should You Buy The Philips Hue Dimmer Switch? 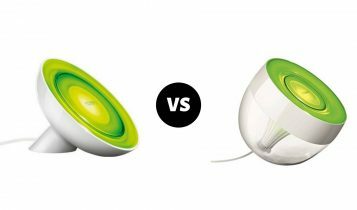 Philips Hue Go vs. Bloom: Which Should You Buy? Philips Hue Bloom vs. Iris: Which Should You Actually Buy? Should You Buy The AmazonBasics Microwave? We are here to give you interesting articles about the latest in technology, as well as how-to guides, video reviews, and honest product recommendations. COPYRIGHT © 2019 · NECHSTAR.COM, ALL RIGHTS RESERVED.